Another great episode under our wings. We got a new location this week, Dorne, though it didn’t make it on the opening credits. And, we got a mention of the infamous Sand Snakes, hopefully we will meet them very soon?! Arya Stark arrives in Braavos looking for Jaqen H’ghar, an assassin she met in Westros, at the House of Black and White, but an old man opens the door and turns her away by saying there’s no one by that name here. Arya is left to chant her revenge names until night fall. Is this a test? 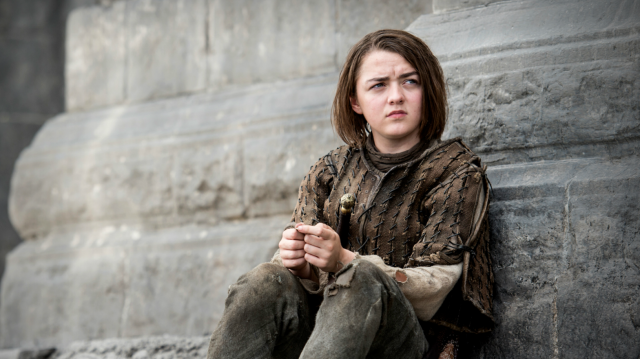 Arya almost feels like a lost puppy, roaming the city of Braavos killing innocent birds. Did she kill the bird because she loves pigeon pie so much, or just a way to get her frustration out? No matter, some men come around the corner to rain on her parade when the old man from House Black and White scare the rotten scoundrels away. Arya irritated by his intrusion, follows the faceless man demanding to know who he was and why the men were so frightened by him. He responds, he is no one and, “that is what the girl must become”. Will her thirst for vengeance limit her learning ability at assassin school? I guess we’ll come to see what exactly her teachings will entail. Stannis threatens Jon Snow by implying he should cut off his fingers like he did to Davos, when he mercy killed Mance Rayder. Smartly, Stannis instead offers him the title of Jon Stark if he bends the knee. Jon decides that his oath to the Night’s Watch is more important, which brings me to this point, sleeping with Igritte was definitely an oath he broke, so will Jon pick the title he’s always wanted or continue his promise to the Night’s Watch, even if it means Ser Alliser Thorne will punish him? Well, Jon’s fate comes from Sam Tarly, as he speaks up like he’s the Vince Lombardi of the Night’s Watch. He reminds them, they won the war against the Wildlings because of Jon. When their commander fell it was Jon who lead them. He was the one that put his life on the line and sought out Mance even if it meant his death. Sam ends his speech with, “He might be young, but he is the commander we turned to when the night was the darkest”. Sealed, Jon is the new High Commander! I don’t see Ser Alliser Thorne going quietly in the night, do you? There is a difference between conquering a city and ruling it. Dany learned that lesson the hard way this week. Instead of following her advisors suggestions, she decided to execute one of her most loyal subjects in front of both the ex masters and slaves. In a reaction she was not expecting, her governed people rioted and almost killed her in the process. How will Dany respond to her latest fumble? Ser Barristan tells her there is a fine line of being too cruel and from what we learn over at Dorne, ruling diplomatically can also lead to threatened alliances as we learned from Ellaria. Before it all fades to black for the evening, we finally get a glimpse of Drogon. Like a typical teenager he stops by to check on his mother and off into the night he goes. Did he feel her stress or was it just a coincidence that her dragon happened to stop by? Her reaction when he flies off is a look of concern. It will be interesting to see what continues to happen in Meereen. Its official, Sansa and I would not get along, she doesn’t like Ale. I love Gilly busting Sam Tarly’s balls about his non existing patience to teach her to read. Anyone a little suspicious of Daario? I’m not sure if he is playing Dany. What got my suspicions going was during the council meeting when he told Ser Barristan he interrogated the captured Son of the Harpy and no one on the council seemed to privy to this detail. Did he do it on Dany’s orders? Interesting! Until next week my friends! I leave you with an Inside Look at The House of Black and White, Game of Thrones season 5, episode 2.